Gifted guitarist vigorously picks away. Eight years ago or so I was sitting 10 feet behind Chucho Valdez, as the big man played jazz piano in the Bluenote. He played so fast I could not see his hands actually move – there was just a blur at the end of his arms. Although this was in my period of deep regard for the gin Martini, I am reasonably sure the blurring was just down to his amazing speed, and not my state at the time. A year or so later, I sat the same distance from Michel Camino, the great Dominican player – more percussive – but again just a blur of speed. This week, watching Al Di Meola at the Union Chapel in London, I got a similar feeling of disbelief. However, this time I could see his hands clearly. They seemed to remain pretty much in situ, while the ends of his fingers (holding a plectrum) moved impossibly fast. Even given that you couldn’t actually see what was happening at the strings, it was hard to understand how so many notes could be generated while being picked essentially one note at a time. There were ripples and streams of notes, machine gun volleys, and arpeggios of surpassing beauty, while Di Meola sat calmly, more stroking or caressing the fretboard, than attacking it. This was a masterclass in guitar playing, combining virtuosity with playing of real beauty. 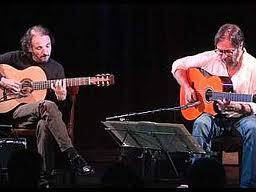 Di Meola played most of the set in mesmerizing unity with Sardinain guitarist Peo Alfonsi. The only way it was possible to determine who was playing which part, was to watch Peo and subtract that from the total sound to find what Di Meola was playing. Although most of the flamboyance and showmanship came from Di Meola, the melodic lead frequently swapped between the two of them as it would in a chamber quartet. In the middle of the set, after a surpassing performance of Piazzola’s double concerto, they both played solos, and Alfonsi’s was particularly light and subtle. The pair finished up with Azzura, Di Meola’s showpiece item, and the standout from his brilliant collaboration with Pat Metheney and Paco de Lucia all those years ago – in London – as he reflected at the end of the set. The concert was also notable for the merest of guitar tunings, one in the middle, and a couple of unobtrusive checks in the second half. This was in marked contrast to the continuous meaningless tunings which plagues even the best folk guitarists. And the due to the absence of a drummer, the gig was also blessedly free of the s*dd*ng drum solo. This was part of the London Bluesfest, but this performance was certainly not the blues. Not really jazz either. DiMeola played from copious sheets of music all evening, and it was quite possible to see how long the concert would last by the number of sheets remaining. So not a lot of improvisation, but wonderful nonetheless. A big thanks to the promotors for ignoring the blues, and in this little outpost, running a liitle gem of programming this week. A lovely intelligent, low-key evening of virtuosic performance.